You can't win the Davis Cup on your own and reaching the semi-finals has been a real team effort. When you consider it's been 34 years since Britain has got this far, beating a team as strong as France to reach the semis is a great achievement for everybody involved. I think our rise through the different Davis Cup zones has been the quickest by any team but our success has still been built over a few years, and I don't think anyone in the British team has crumbled. Everyone has produced when it matters. We've had great performances from the likes of Dan Evans and James Ward, Colin Fleming and Ross Hutchins won a bunch of doubles matches, Dom Inglot didn't get the win in Glasgow but he played a fantastic match against the Bryan brothers. Having got this far, I'd obviously love to go on and win it, but Australia will be extremely difficult in September and everyone has to play their part again. As I say, you can't win this event as a one-man team. One of the great things about the Davis Cup is that when you're struggling, you can call on the crowd to help you out. I was definitely worried when I was a set and a break down against Gilles Simon because I felt a little bit flat and he came out playing extremely well. I didn't know if I was going to be able to turn that around. In the first and second matches I had really made a point of getting the crowd involved and it helped a lot, but to be honest on Sunday I didn't use the crowd quite as much, or celebrate so often, because I was so tired! I had to conserve my energy. Celebrating wildly after winning a big point is great when you're fresh, but that does also use up energy as well. I tried as best I could to just play each point at a time, even though I was getting frustrated and emotional. The team at the side of the court is also important in helping you through tough times on court, and my fitness trainer, Matt Little, is one of the best at getting everybody going - although I don't think he likes the tag of cheerleader! He's a lot more than that. He's a passionate guy and has been part of the team for the last five or six years, and I've known him for a lot longer than that. 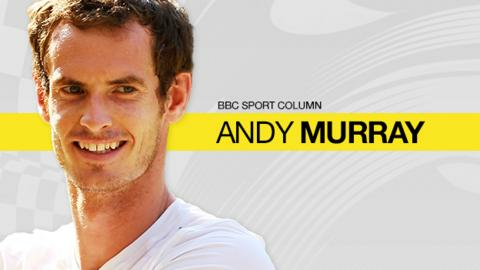 He's good at his job, first and foremost, but he cares about British tennis and supports the team very well. It's not easy playing three such big matches within three days, it is challenging and now I need to make sure I manage my body well, listen to my team and get as much rest as possible. It's been a long first seven months of the year. I don't think I've ever played this much tennis in my life at this stage of a season and it has been tough. At different times my body has not felt great, but I've managed to make the most of it. I don't always want to be playing something like 30 matches in 80 days though, I don't think that's great in the long term. I don't know when I'll start hitting again but I will probably head to Washington for my next tournament in about 10 days or so. I won't have time to go to Miami and do any preparation this year so will probably rest up for at least a week, then start training and head over to the States to get ready there. Before that, I'm going away on holiday and heading for the beach. I don't plan on doing much, just relaxing and getting some time away from tennis to recharge. The Davis Cup crowds at Queen's Club and in Glasgow this year have been unbelievable, the sort of experiences I will never forget. They played a huge part in both ties and the whole team are incredibly grateful for the support. See you all in September.